Personalised Wedding Gifts is a shop for unique personalized wedding gifts and accessories. Here you can buy gifts for any taste and budget as well as find inspiring ideas. To help customers not to get lost in this variety of products and ideas we developed the site with enjoyable design and modern functions. 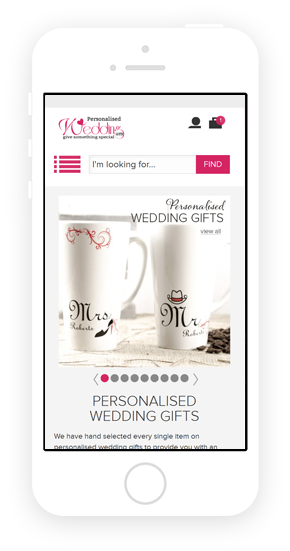 Personalised Wedding Gifts is a part of Personalised Gifts Shop chain. The shop specialises in selling gifts and souvenirs for weddings only. Working on this project we tried to simplify as much as possible the site visual and functional elements, so that search and shopping for wedding gifts made the arrangements pleasant and efficient both for the bridal couple and their friends and relatives. The user-friendly navigation lets to orient quickly in the website sections and find the desired products. Bride and groom, friends, family members gifts – everything is at hand and in the correspondent categories. Ensures easy reading and navigation on all mobile devices. The online shop not only sells own-produced products but also provides a trading facility to other manufactures and vendors. The distinctive feature of the shop in general. Here you can additionally personalize any chosen unique gift with various engravings and applications. With the “Ask us” service presented on every page, the customer can call the shop manager or ask a question any time via the special contact form. This helps to solve the customers’ issues on time and receive feedback. Many pages of the shop, such as product pages or the cart, have the section with the products the customer may also like. Such product demonstration and recommendation helps to introduce the product range to the customer and increase sales. Enables express checkout without the standard payment procedure on the shop site. Just sign in your PayPal account and pay for the order. The blog keep customers interested and informs on news, trends and the shop life. Integration with the rating and review service Feefo enables to simplify the customer feedback and to generate automatically the brand loyalty statistics. We couldn't have asked for a better service than what they have achieved. We found ASTRIO to be very professional and always paid attention to details. They have carried out a very complex project for us. We couldn't have asked for a better service than what they have achieved. We would recommend ASTRIO and would certainly use them again.